Okay, the madness part is more due to my exhilaration at the prospect of seeing a new issue of Daredevil come my way next week, even though there’s plenty of madness going on in the pages of the issue itself. 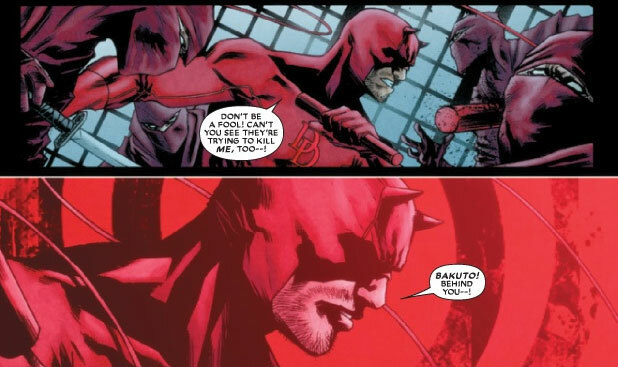 Marco Checchetto pushes to new heights with his work here and begs the question of how artists working on Daredevil manage to be so darn good all the time. Holy smokes! For a small sample of what I’m talking about, see the panel below or check out the full preview at IGN. Oh, and are those radar rings? Why, yes they are. We haven’t seen those in a while. For those of you who enjoyed my review of Daredevil Redemption, or more specifically the artwork featured in that review, I will have a review up later this week of another Daredevil-related title that might be of interest. We’ll be taking a look at Marvel’s mini-series Powerless, written by Matt Cherniss and Peter Johnson, with art by – you guessed it – Michael Gaydos. I will see you then!